If you're looking at the advertisement (right) and think it looks the same—it does to me, too. That appears in the back of the Photrix SS instruction manual, so I figure they came out at the same time (late 1930s). The wooden cabinet is a little different but the unit itself is certainly the same. 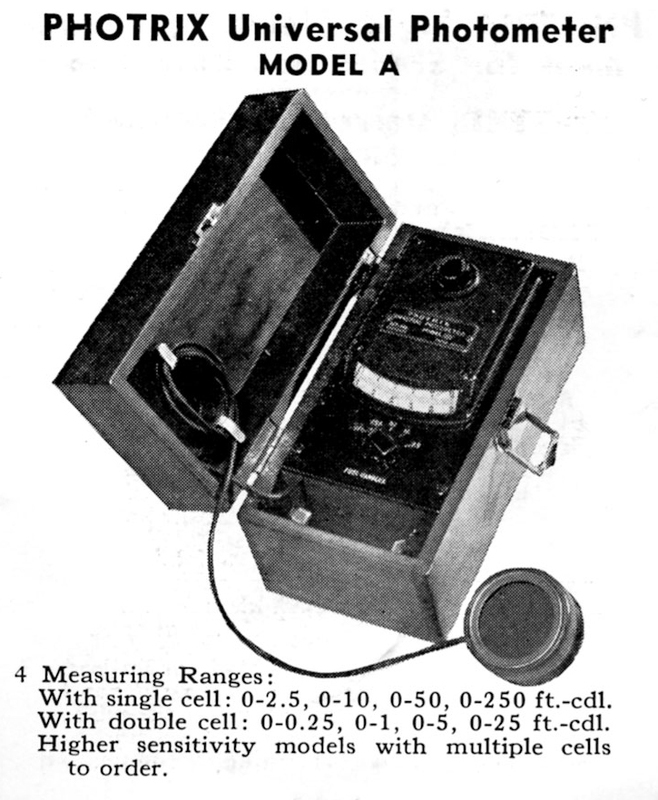 I don't know anything about Photovolt except that a) they're still in business and b) they seem to have appeared after World War II with a variety of lab-test equipment, particularly photo densitometers. 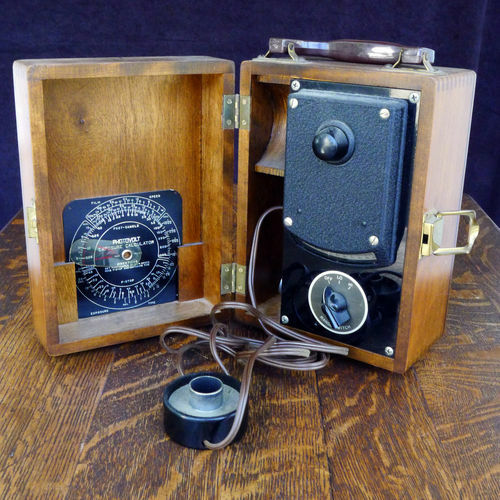 My guess is that Hickok spun-off the unit that made this equipment or sold the rights to manufacture it, and Photovolt came to be. The first (and only) evidence of existance I've found for this meter is from a 1948 issue of Minicam Photography, where it's listed as the 200A model; it's obviously the same unit. I have no idea when my "M" revision came out. This is one of the nicest meters I've come across in terms of effort of workmanship. It's a wooden box that's very nicely manufactured—doesn't look cheap at all. It's got four rubber feet on the bottom and four on the back so it can be stood upright or laid back for use. The cell has its own little cup to hold it in the side section where the cord goes. The handle is hard plastic, like on luggage, so it hasn't torn off the way more handsome leather handles would have done. The meter works—it's a selenium cell so no power. You start by shading the cell from light and zeroing out the needle on the meter face, which is done by turning the big knob on top of the unit. Select a range (start with HI) and then take a reading. 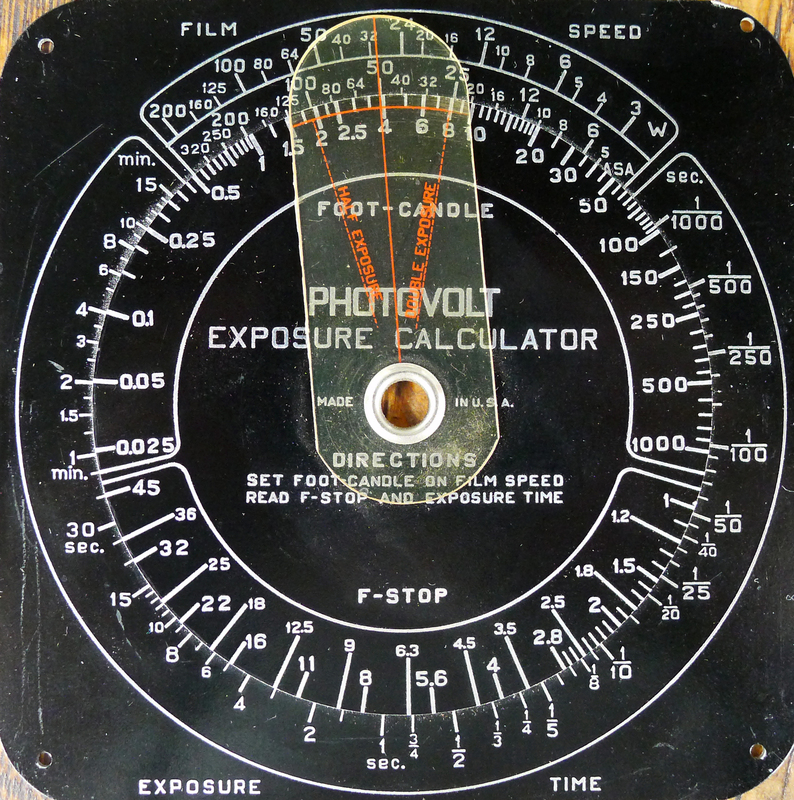 The original Photrix appears to have two scales but this Photovolt only has one, so you have to factor in the range setting on the exposure calculator—which is missing. I found this photo for another 200M on eBay. If you look in the door, you can see he's got the exposure calculator card. The seller was kind enough to scan a large copy for me. Click on the image (right) for the full size version. It appears, if you look at the card, that the meter is calibrated directly in footcandles. If that's true, you can use a lot of other meters' calculators to do the job, like any of the Weston Masters. If you were really serious about using this thing, you would get a known accurate meter and simply do a comparison at various light levels. If the 200M says it's reading 25 footcandles, what does your known-good meter read? What about 50 footcandles? 100 footcandles? 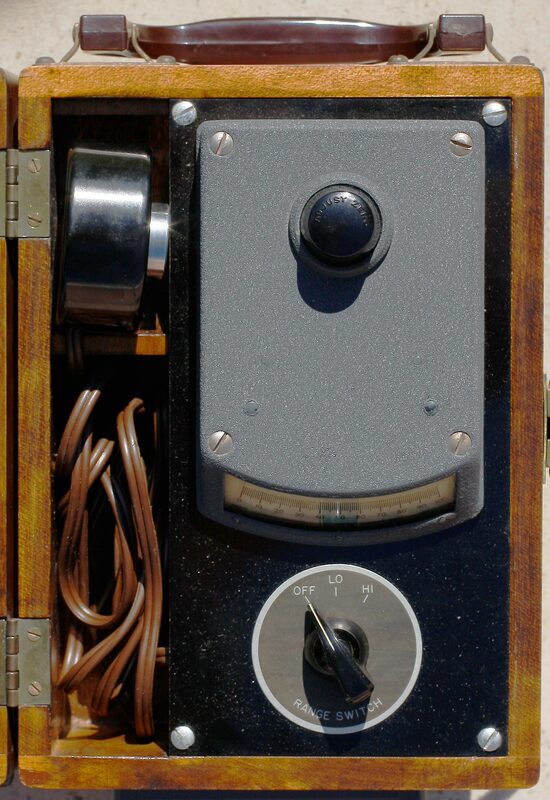 Once you have the corresponding numbers, you can use the known-good meter's calculator dial to work out camera settings. Nice meter. Some day I hope to find the exposure calculator card for it.